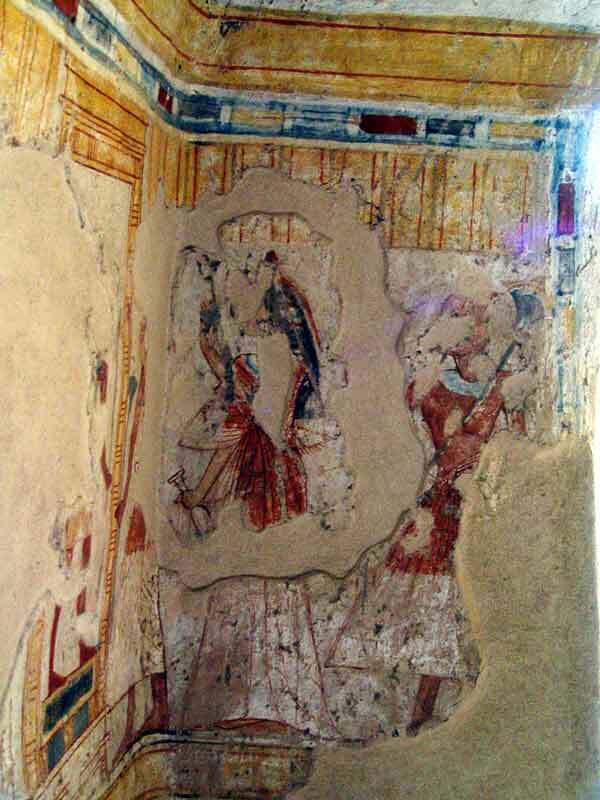 The tomb of Shuroy dates from Ramesside times, Shuroy, was "brazier carrier of Amon"His wife Our-Neferet was a chantress of Amon. We do not know anything more about them. 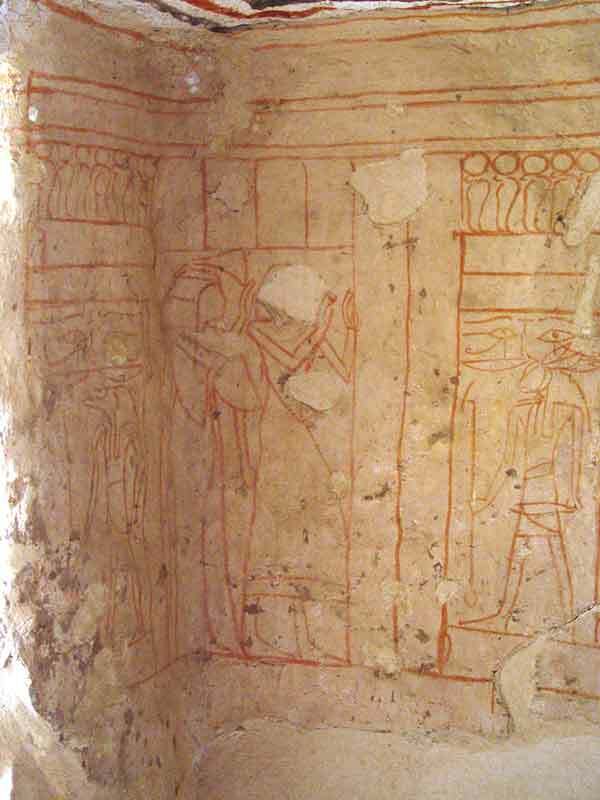 The Abbott payrus dates from year sixteen of the reign of Ramesses IX, speaks of the tomb: "The pyramidal tomb of king Nebkheperra, Son of Ra, Antef It was recovered close to being penetrated by the thieves who had dug a tunnel into the tomb of the superintendent of offering of the House of Amen named Yuroy. This is the only damage. It is intact. The thieves were incapable of reaching it." (Yuroy = Shuroy). 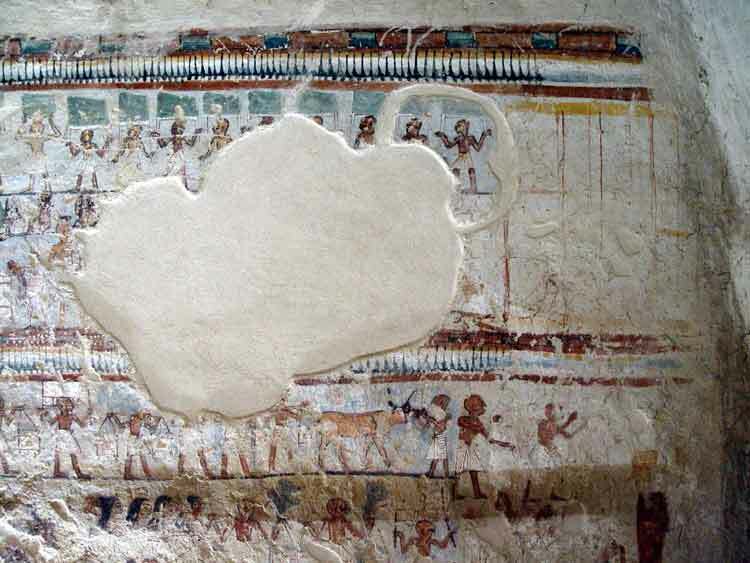 The tomb is of average size and adopts a "T" formation. 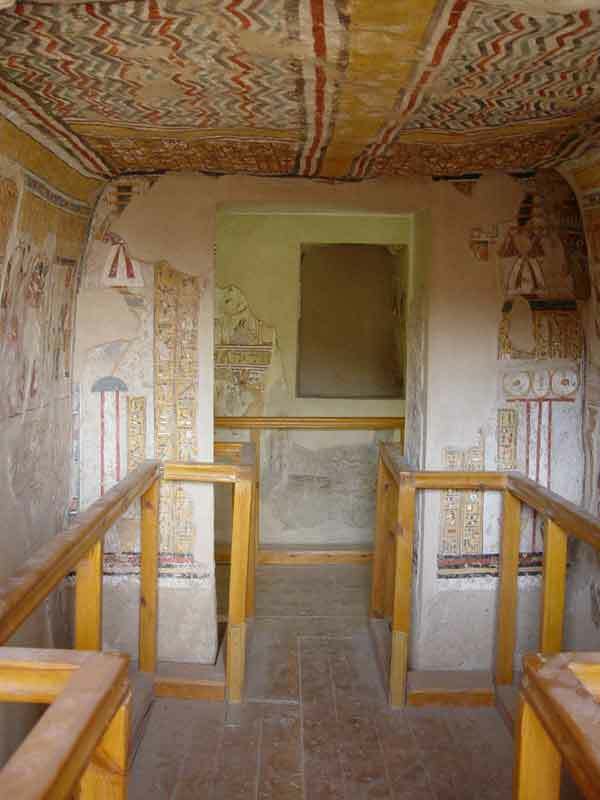 It comprises two rooms A and B. 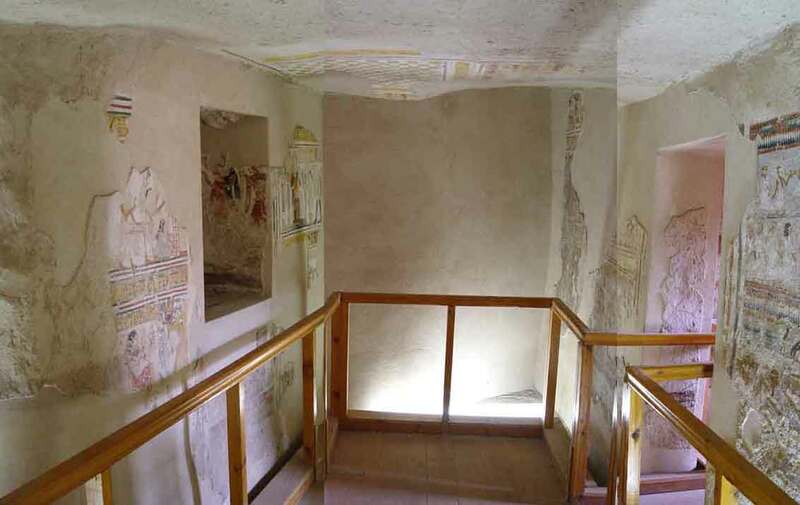 It is unfinished, and a great part of its plasterwork has disappeared. 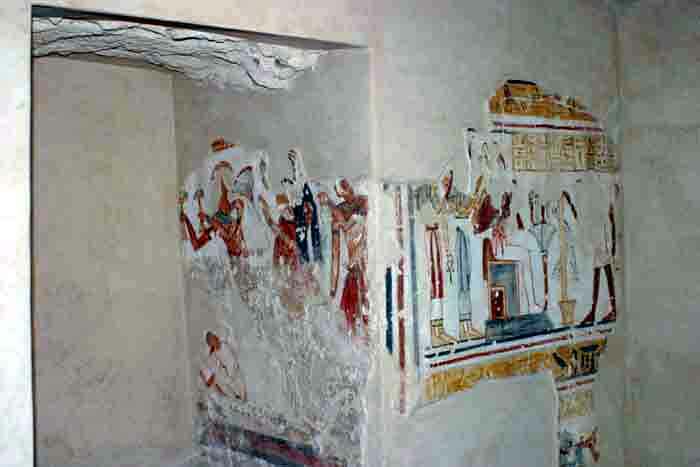 What remains was the subject of a restoration in 2002. The quality of the overall execution is uneven, rather average. 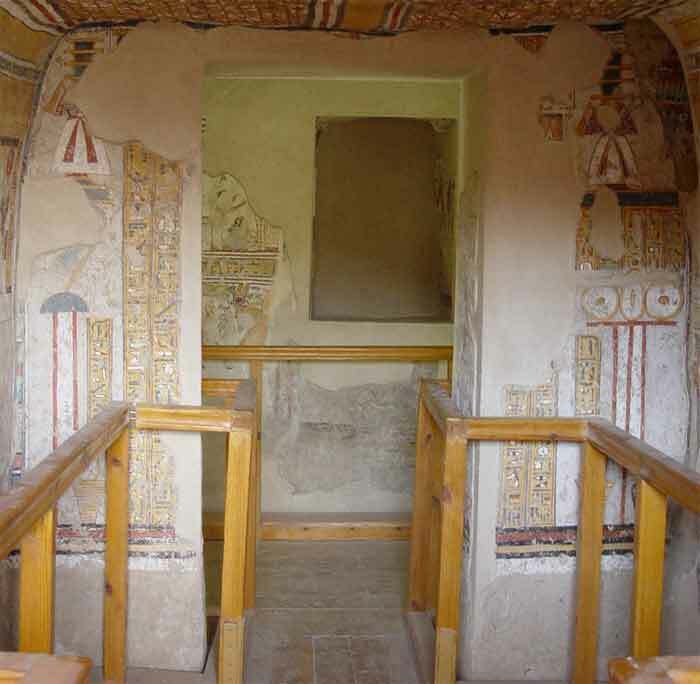 the upper half of the bodies Shuroy and his wife, are turned towards the entrance and Shuroy holds in hands two braziers, as he will do in the remainder of the tomb. 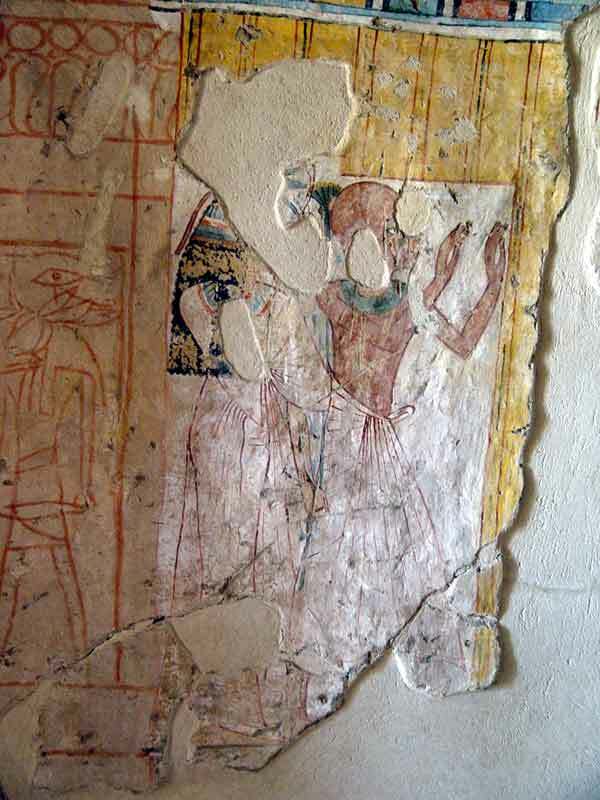 On the left wall a woman whose features are only sketched in red paint holds in a hand a Hathor sistrum. The rattle noise that this instrument produces was supposed to imitate the rustle of papyri and attract the great goddess. and towards the bottom alternating red, white, black and blue wavy lines. 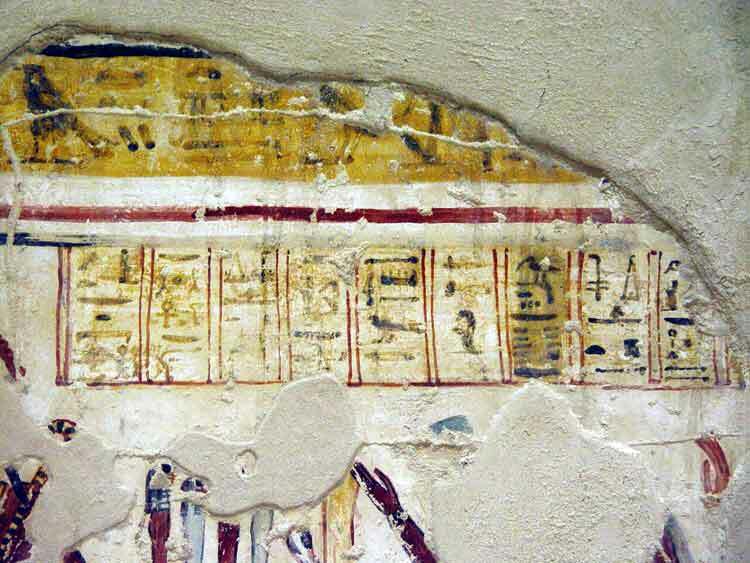 The Panels are divided up by thick golden yellow bands framed by thick white, red and black lines. 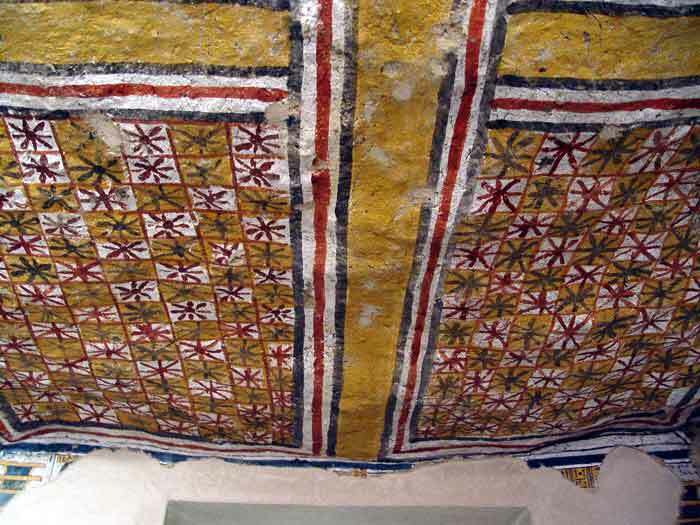 a single ceiling segment remains comprising a checkerboard alternating white and yellow squares. 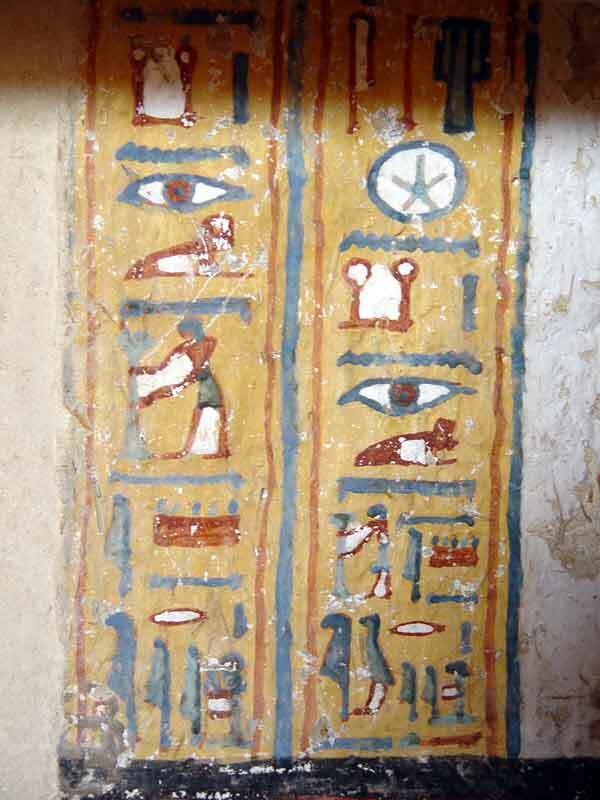 Hieroglyphs are drawn on a yellow base, conventional colour of gold . 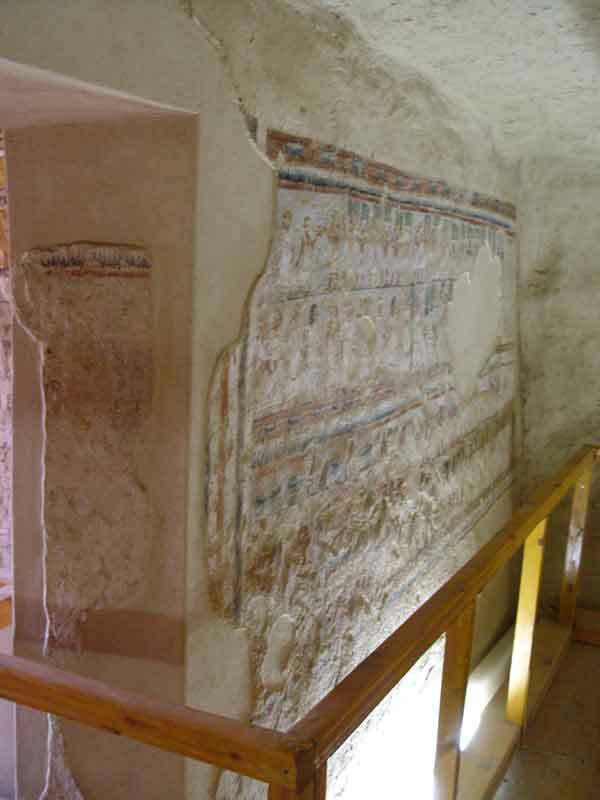 The columns for hieroglyphs are separated by thick blue and red lines. 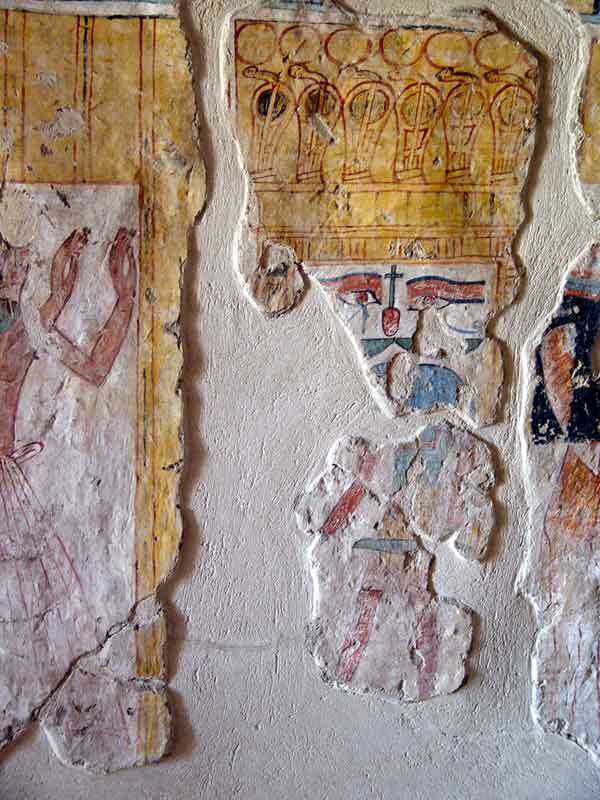 No text was registered on either of the walls and the intended columns to contain the hieroglyphs remained empty. 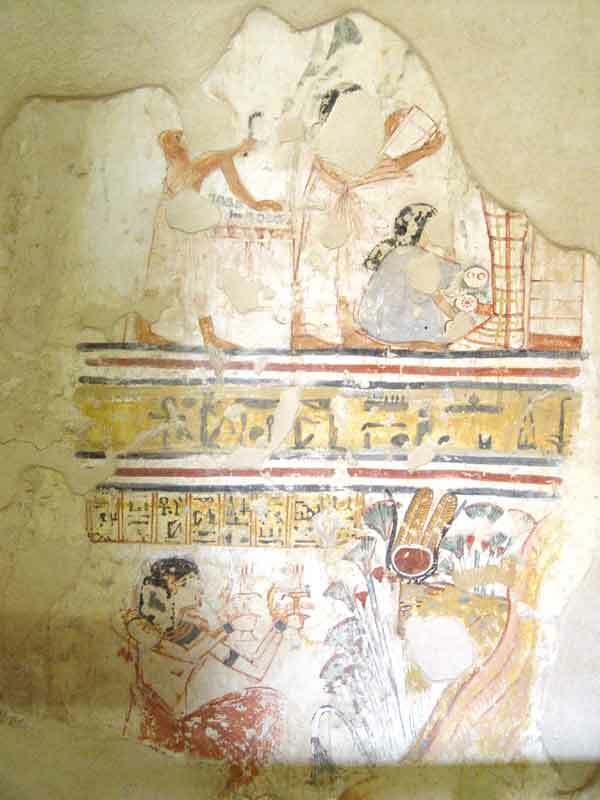 On the two walls one finds representations of the "Book of Gates". 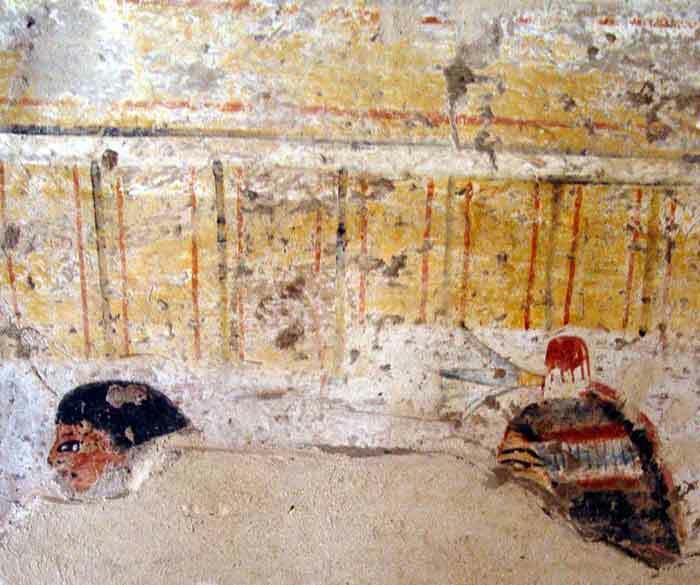 The wall starts with the view of the deceased's feet, very damaged He holds in his right hand a stem of papyrus with an open flower. Before him is the representation of a door, where, standing on an oblong pedestal is a genie holding in his left hand a ouas-scepter of power. 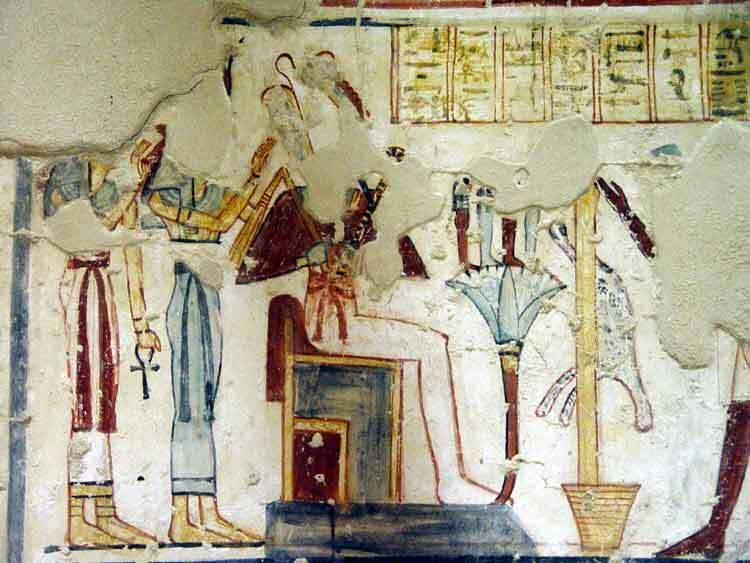 This first test passed, the couple formed by Shuroy and his wife appears in worship in front of a second door Shuroy carries in his right hand a raised brazier that he presents above a table of offerings. 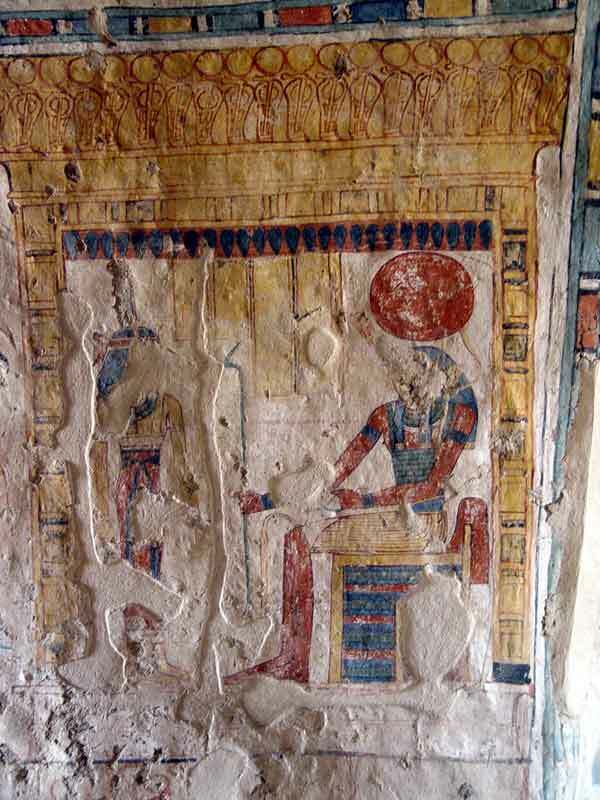 At the top, the first represented god has a very damaged but human face, and he is covered by a solar disk surmounted by an uaeus. He is probably intended here to be recognised as Re. 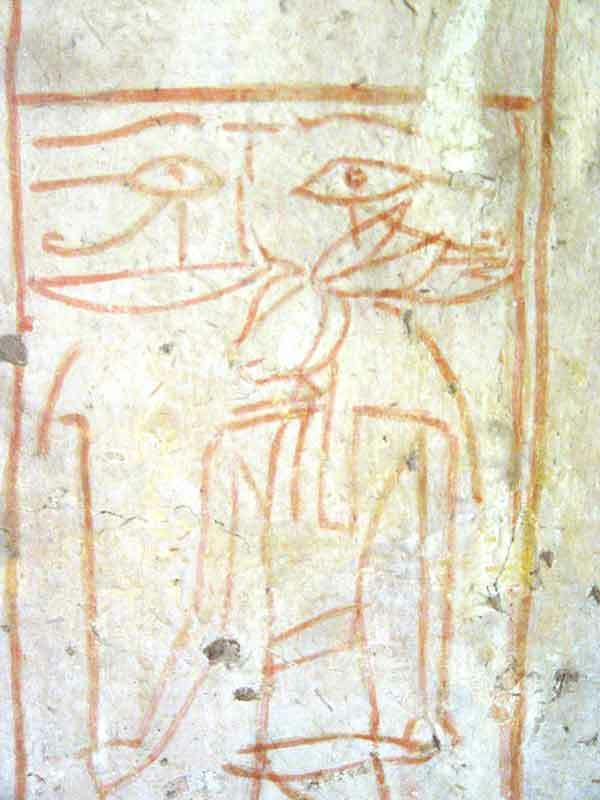 Behind him, one finds the representation of Thoth with the head of an ibis, covered by his lunar emblems (full moon and segment). On top of his red garment stands a feather of Shou. The bottom register holds two goddesses that one cannot identify positively. The first has blue-green flesh, the one at the rear has a clear complexion traditionally reserved for females, and her head is wrapped by a red ribbon whose folds fall to the rear on her wig. 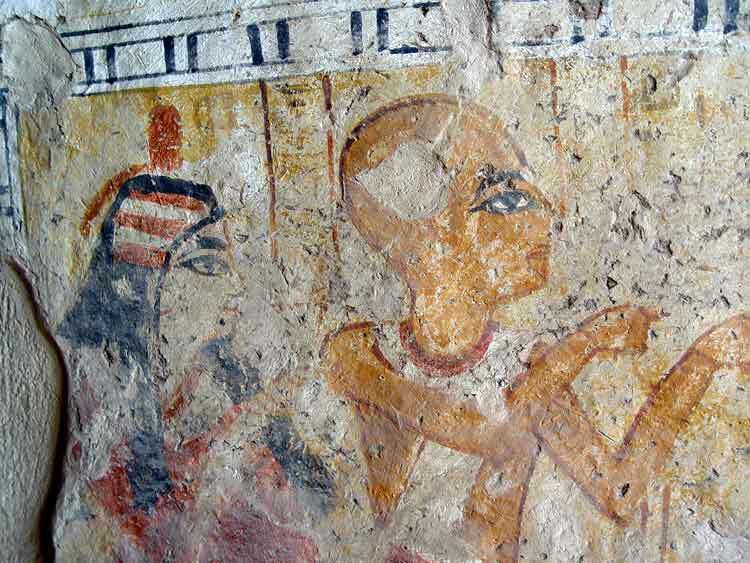 Shuroy has a shaven head and on his chest is represented a large ousekh-necklace (in fact only sketched). 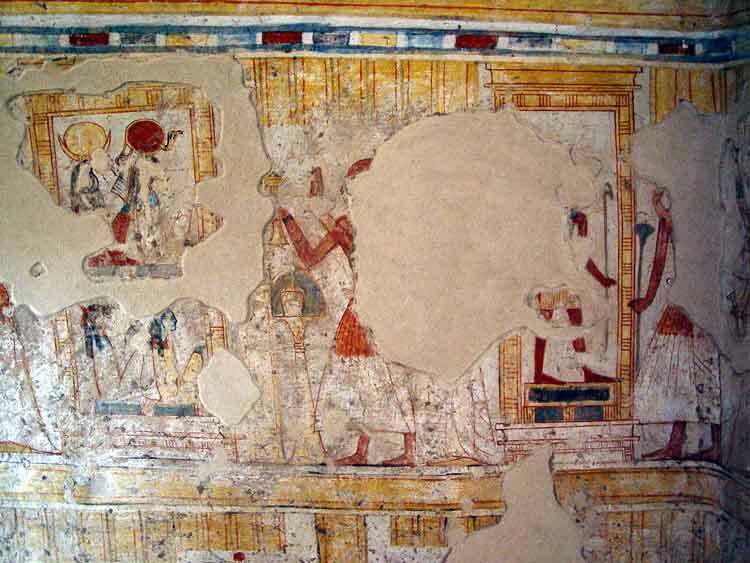 He is dressed with the loincloth of ceremony of the time, worn high up on the loins with a large white front section. He again makes the offering of a brazier which burns wads of a fragrant resin whose smoke is directed toward the shrine. Both tables of offerings which he dedicates are decorated of breads and vegetables. 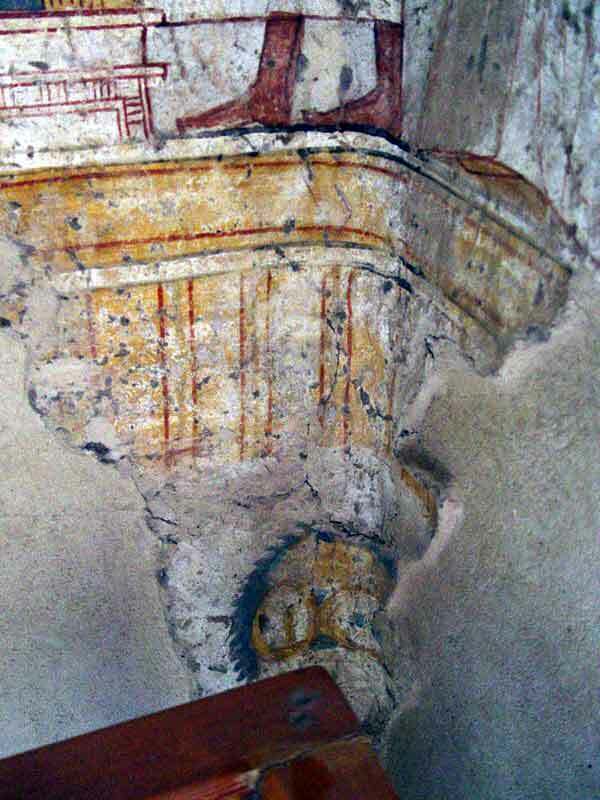 Below, a high vase stands on a small altar. 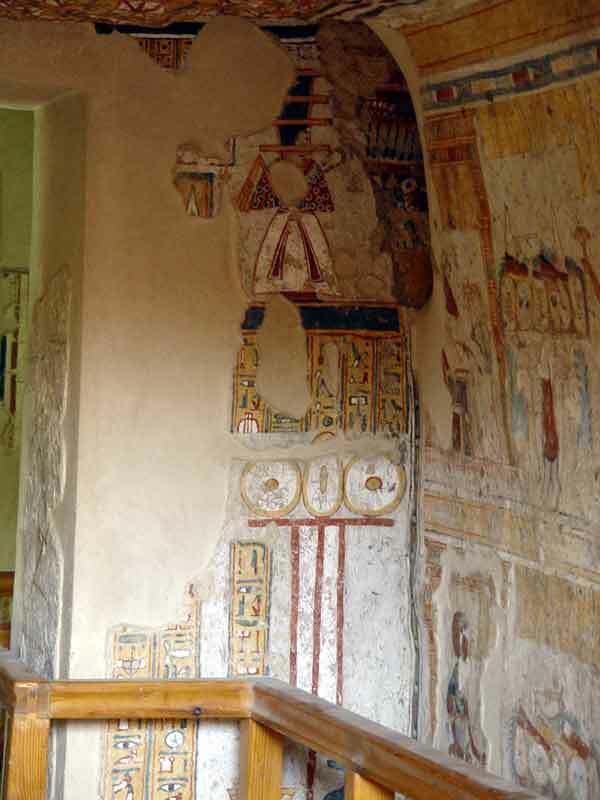 The large shrine hold Osiris, master of the eternity and the underworld . The god has dark green flesh and holds in his hand the nekhakha-whip and the hekha-scepter, symbols of his power. He is seated on the usual ancient cuboid seat. 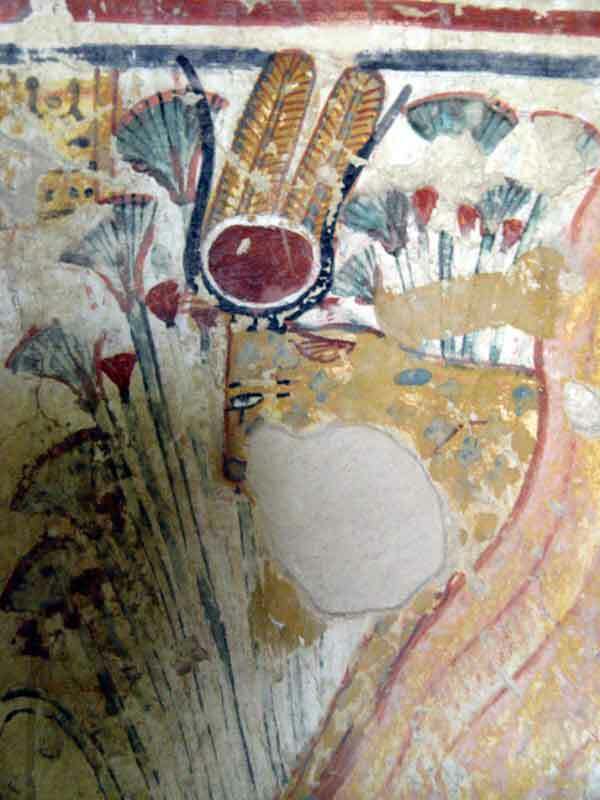 Before him, an extensively open lotus flower supports a representation (sketched) of the Four Sons of Horus. It is separated of the upper register by a thick yellow band with double red lines. 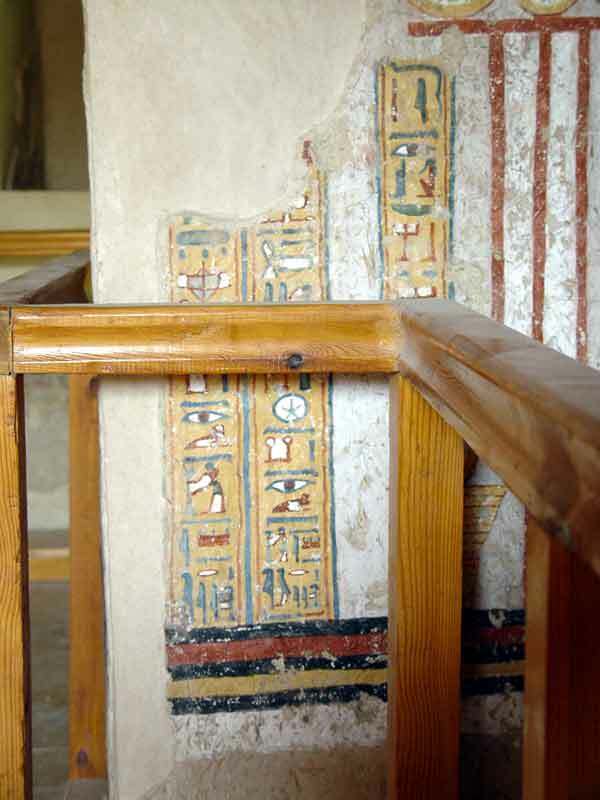 It is extensively destroyed and photographing of the remaining elements is made difficult by the protective wooden rail that was – understandably - placed in front. And one sees the couple thus in worship , soliciting the entry into the underground world. The woman wears on her head a lotus flower opened forward, symbol of rebirth. Having passed this test, the couple meets in the same attitude before another door. The decoration having this time been finished, we can better appreciate the beautiful curled wig of the wife surmounted by her lotus flower She is clothed of a, nearly transparent, thin linen dress, which allows conjecture of her beautiful shape. His chest is adorned by a large necklace. 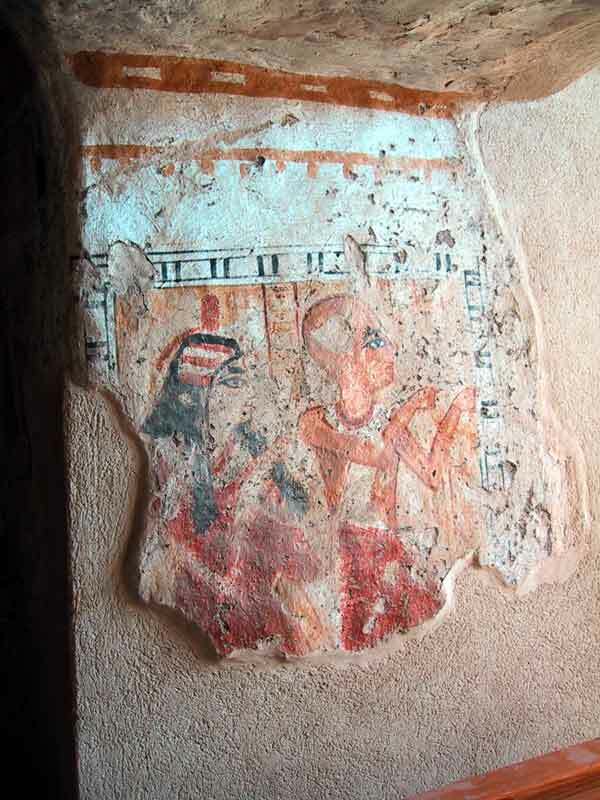 One notices the difference of complexion corresponding to the Egyptian pictorial standard: the woman has the very clear skin, while the man is tanned. 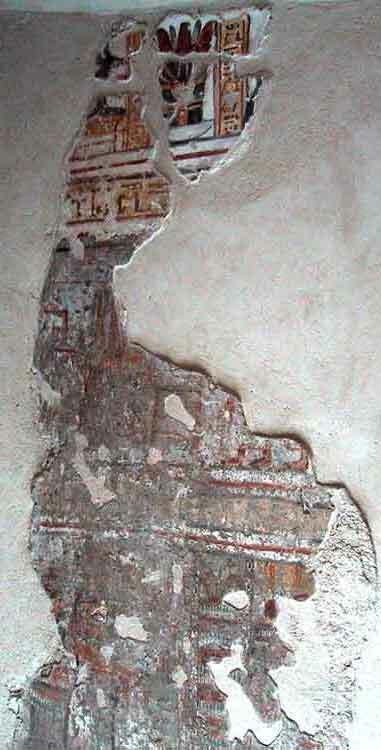 bronze colour. Shuroy who had the head shaved in the previous representation is now dressed of a wig and carry the short beard of the living. Before them, a laden table of offerings covered with: breads, meats, mandrakes, grapes, cucumbers, leeks... under it, two vases with red bodies, toppped with black lids. The shrine to which the couple face is splendidly decorated and it is very normal because seated there is the great god Re (Horakhty), sovereign of the day star . 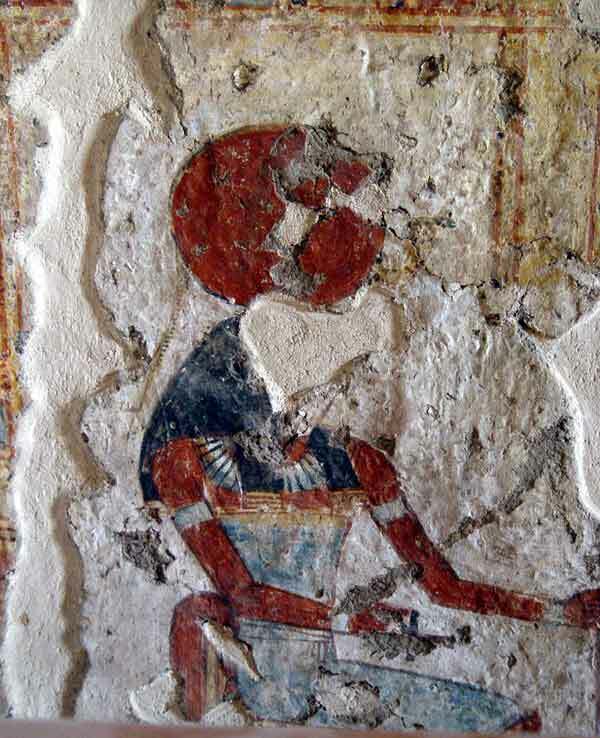 As with the Osiris on the opposed wall, which he matches, the falcon-headed god is seated on a low ancient cubiod seat. 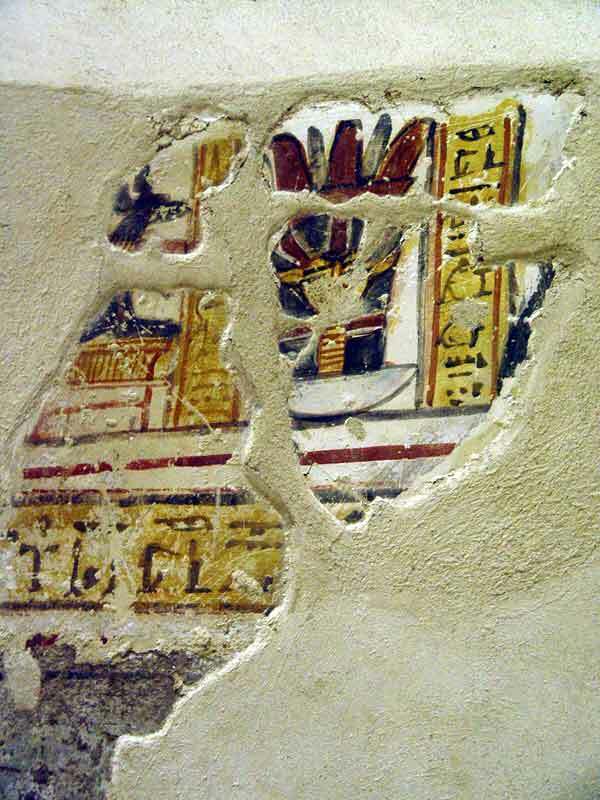 He holds in his hand the ouas-scepter of power and the ankh-sign of life. 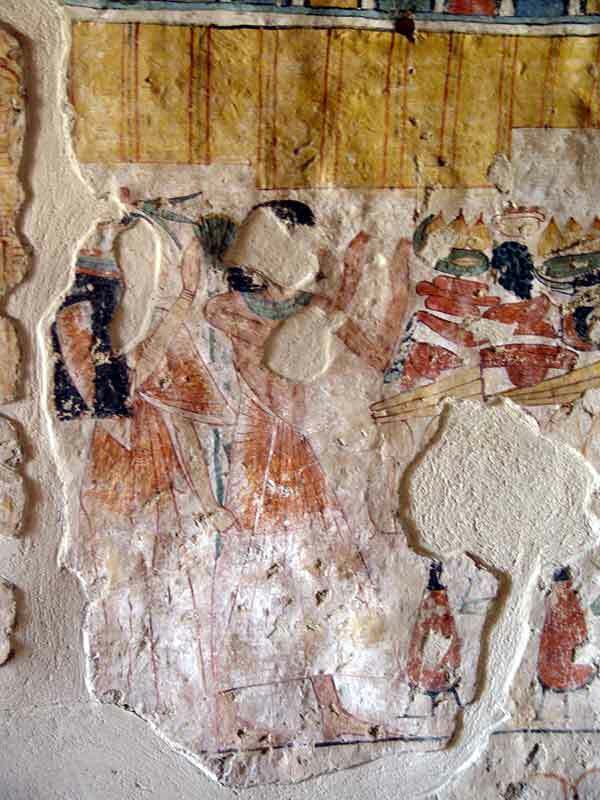 Standing before him and coping him, his daughter, the goddess Maat Although the text doesn't exist, one can imagine that she comes to announce to the great god that the couple Shuroy and his wife have acted in accordance with his will during their terrestrial life. 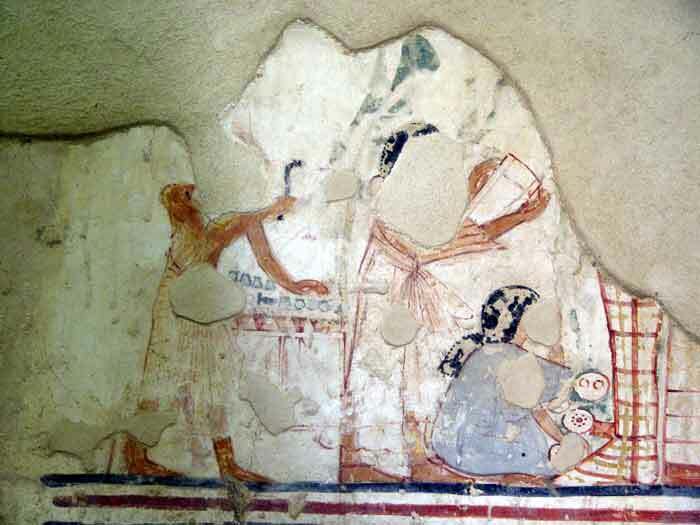 She thus replaces the scene of the "weighing of the heart", that is not represented in the tomb. great gods that preside over the fate of the earthly world and underworld. This is incomplete, with only the outlines drawn in red ink. 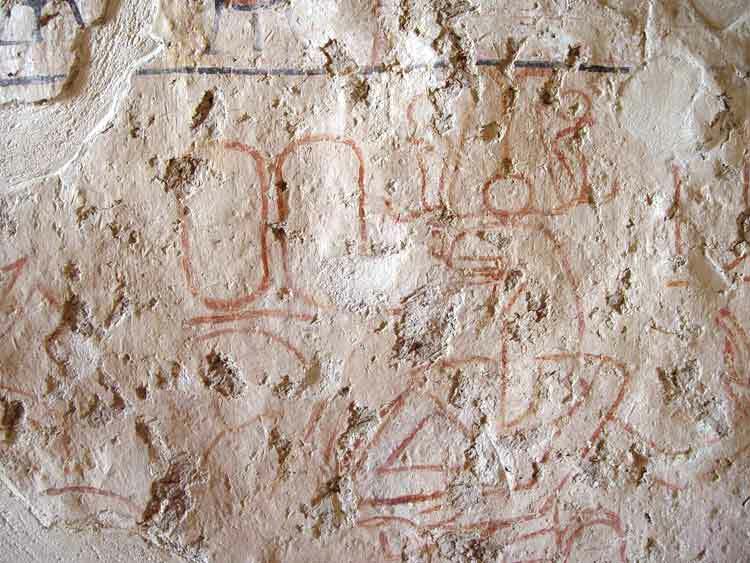 Besides, it is only preserved in the North part, and again very partially. 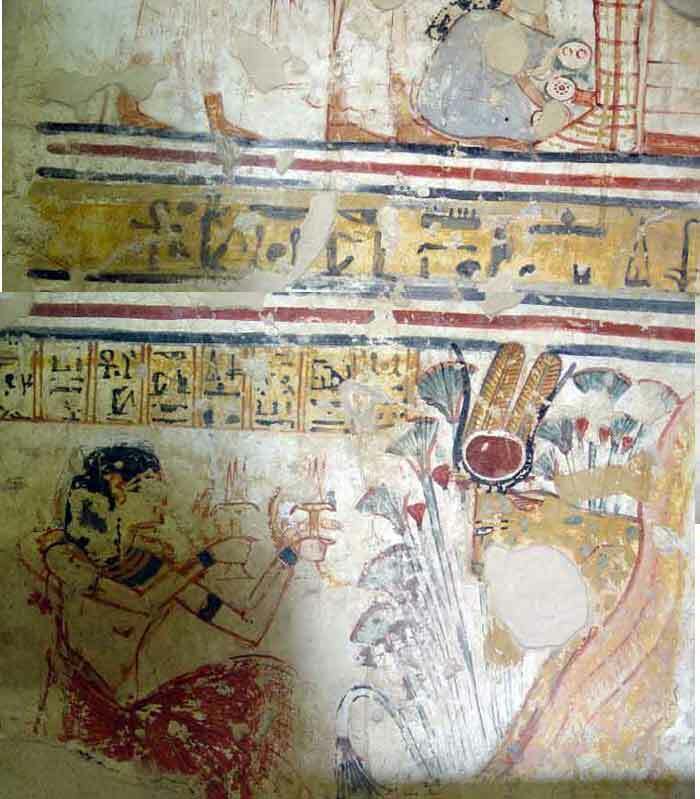 The Shuroy couple, now invisible, do homage to a Pharaoh and to a queen behind him whose cartouches remained blank; we are permitted to think that it refers to the two protective sovereigns of the necropolis, king Amenhotep I and his mother the queen Ahmes Nefertari of which one recognizes the hairstyle including the remains of a vulture. 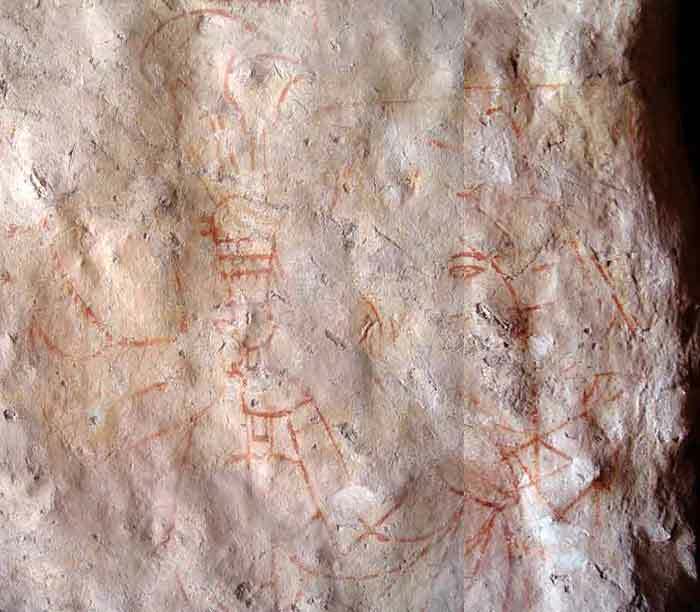 Traces of a cortouche is also recovered before her . Behind her, a representation of the symbol of the west. 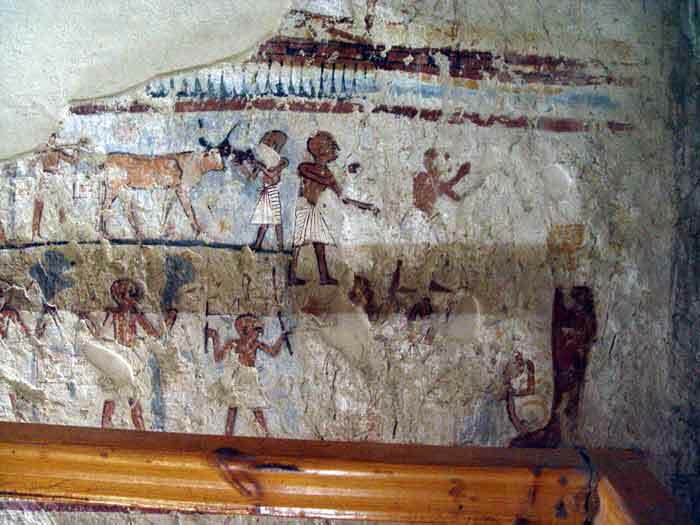 it represents the beginning of the journey of the deceased toward the underworld. They establish the real beginning of the North and South walls with which there is no transition. 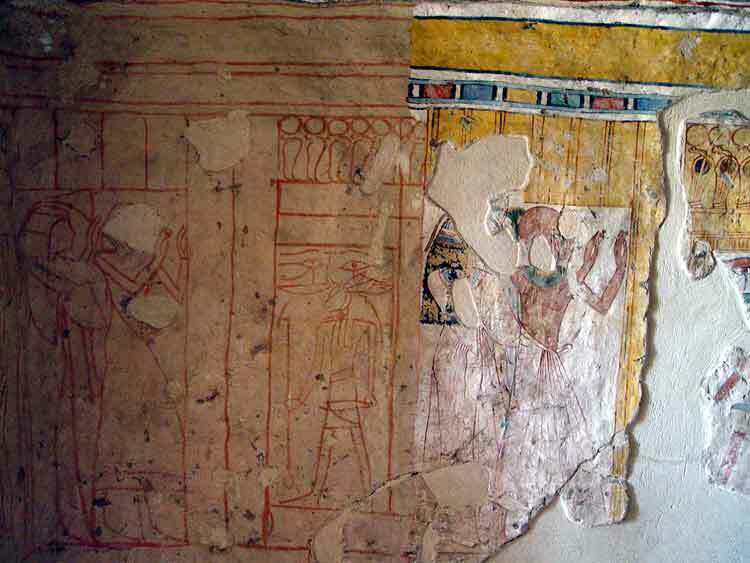 an unidentified masculine character with the shaven head cold be the deceased's son - holding in his left hand a long stem of papyrus. One notices that this scene is framed on two sides by a border of green, yellow, red and blue rectangles, edged by a thick light-blue line. 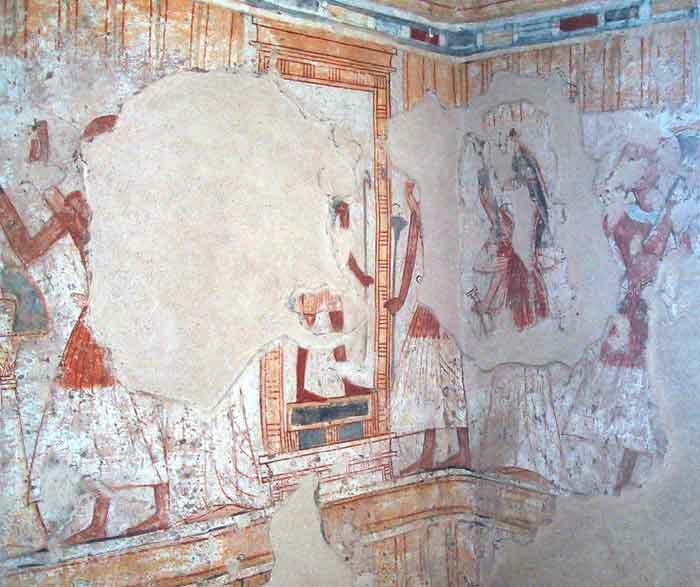 This border starts vertically immediately at the beginning of the scene and continues horizontally all around the piece, thus separating the walls from the ceiling. 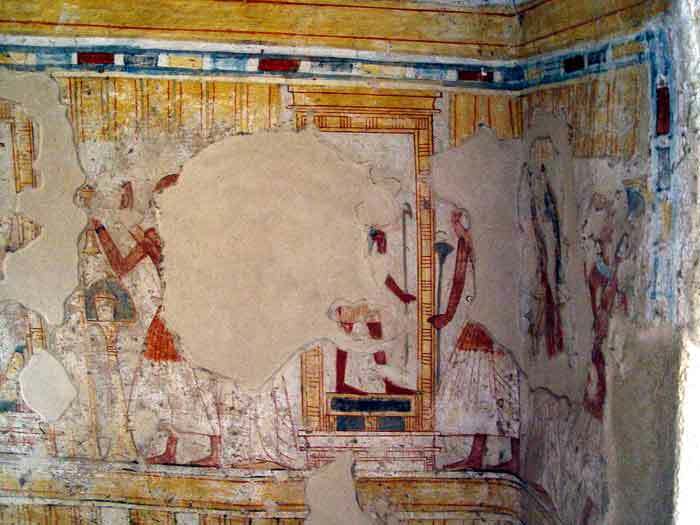 the scene has only been sketched, the red brush outlines a shrine surmounted of cobras and containing a genie carrying a knife. Its drawn out face could be the one of a crocodile. 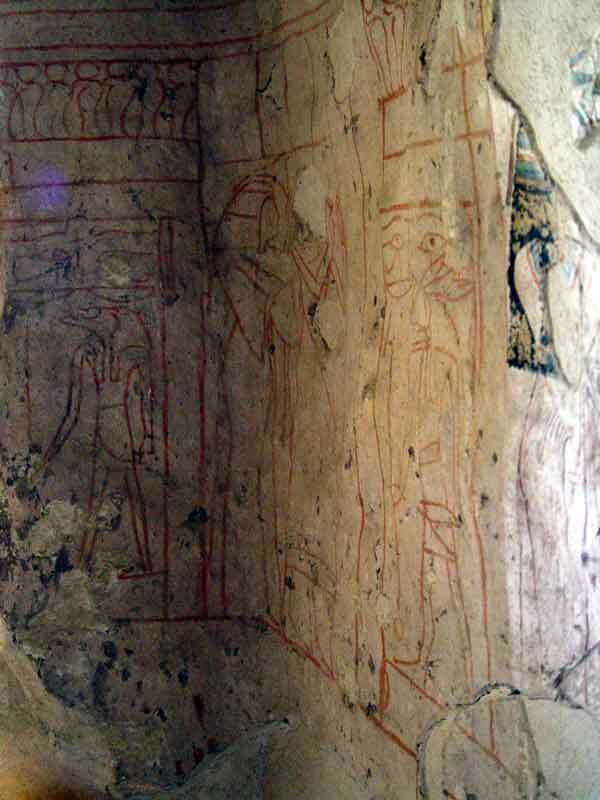 Over of him, as in other shrines of the same way type, the two Oudjats eyes are sketched, separated by the Nefer sign. 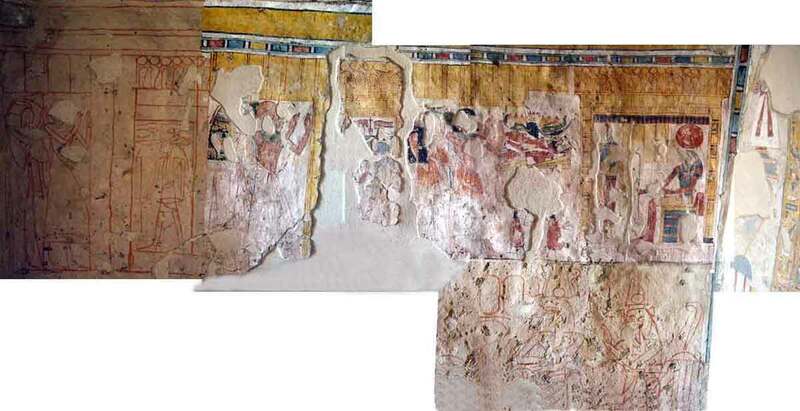 Very remarkable are the two symmetrical pictures of Djed pillars . 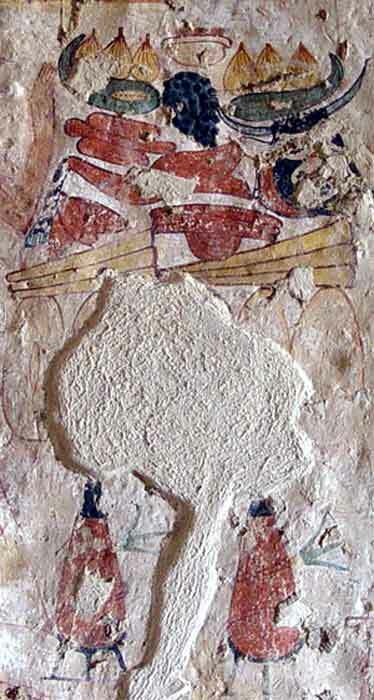 They are dressed in a red jacket, decorated with blue and white rosettes, and with a large white loincloth. 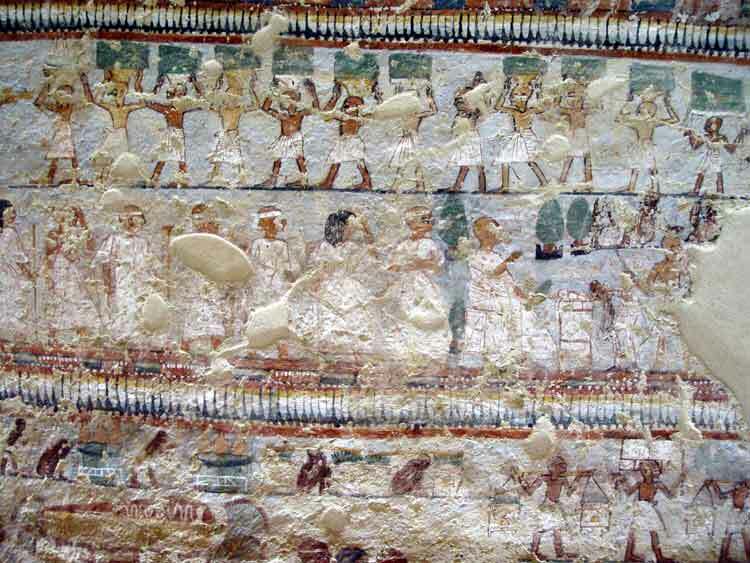 Around the midriff is a red scarf (slightly different for each of them) whose large flaps fall on the loincloth. 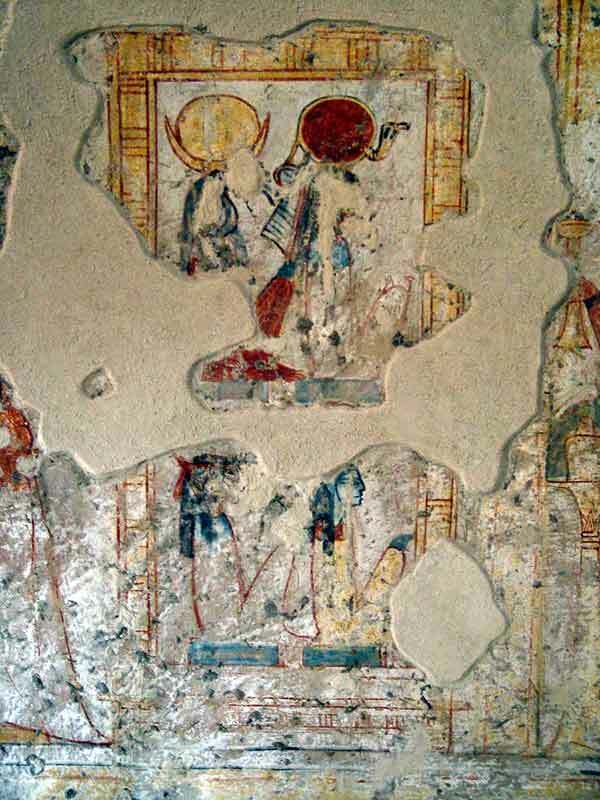 Under the two Djeds, the representations diverge from one wall to the other. on the left a vast symbol of the west, with to right of its base a basket surmounted by an oval bread . , the blessed This text surmounts a "table" stilted structural of the round and oval breads. 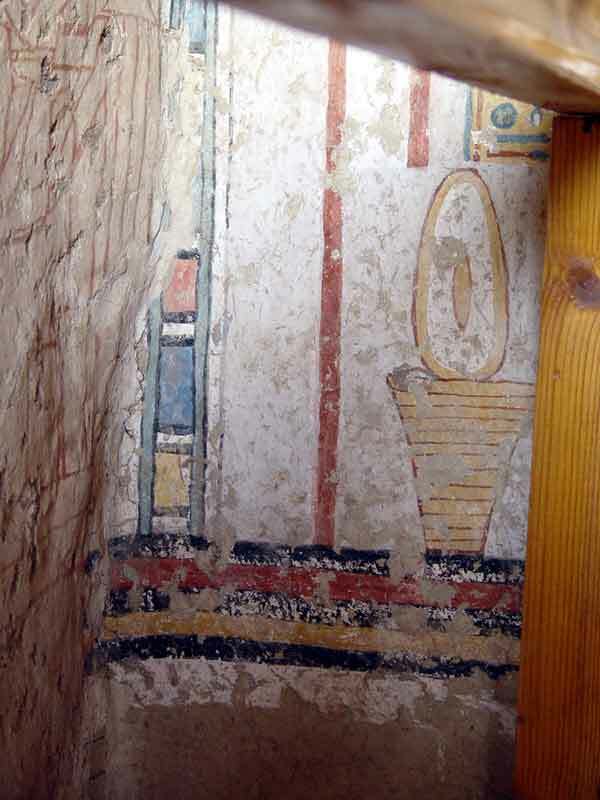 base, a basket surmounted with bread and a red and blue pot-bellied vase. 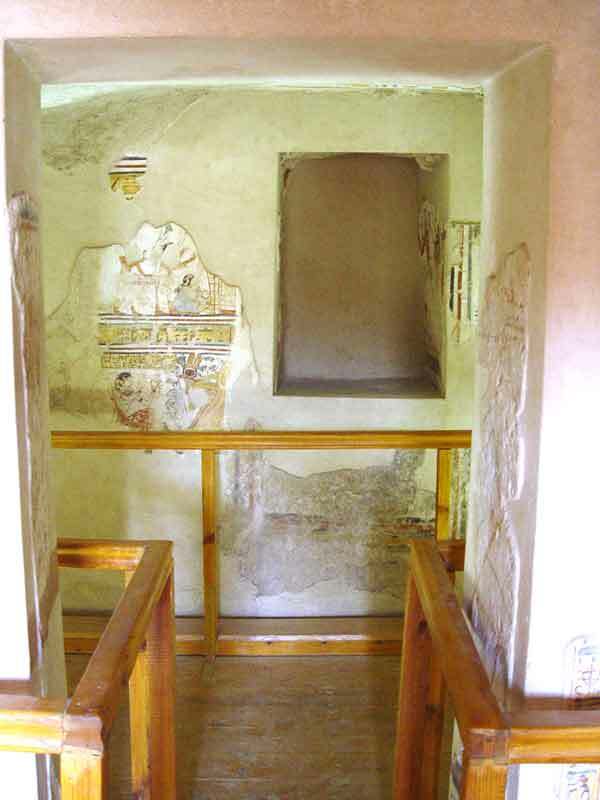 A small corridor where only some sketches of the couple remain in the entry to room B. The room has an irregular rectangular shape. 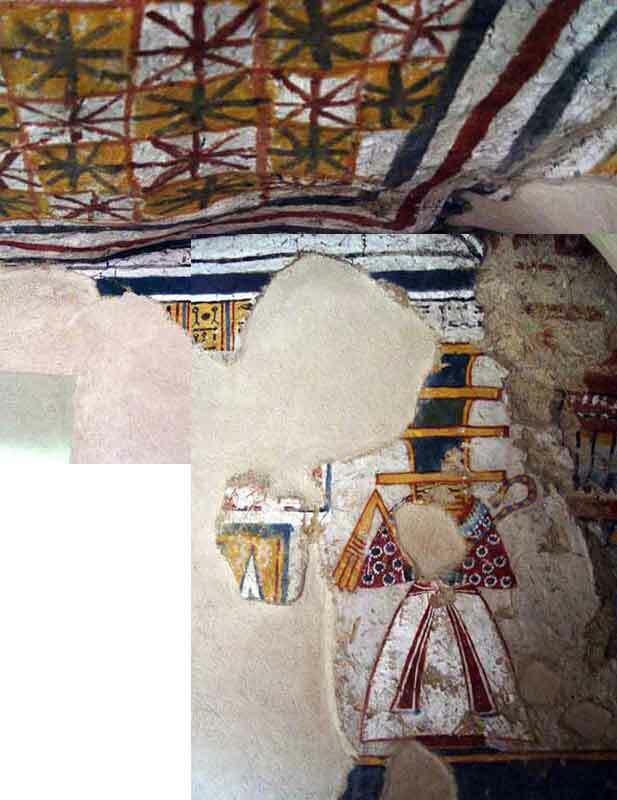 in what remains - white and yellow square motifs. 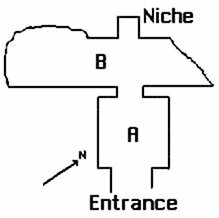 It has a roughly centered niche on the East wall. 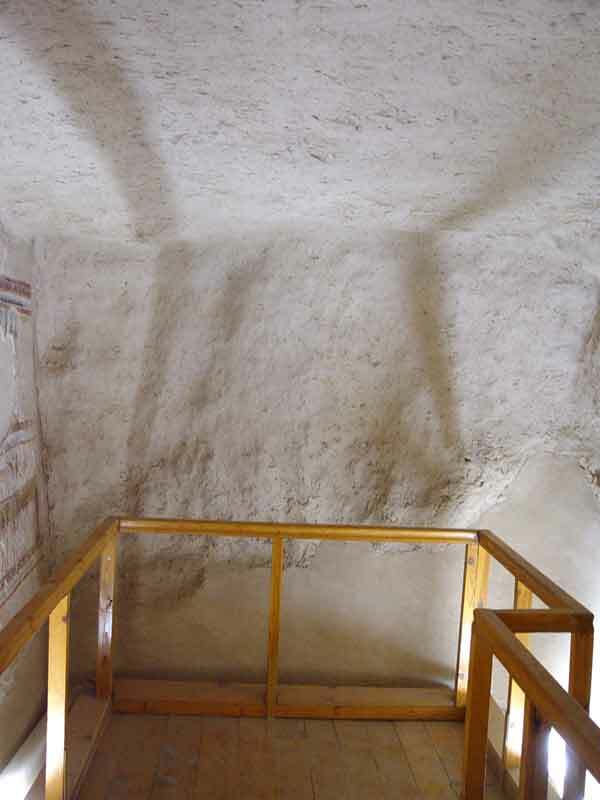 On the left of the niche, the small preserved parietal segment includes two registers separated by a thick yellow, inscribed, band. 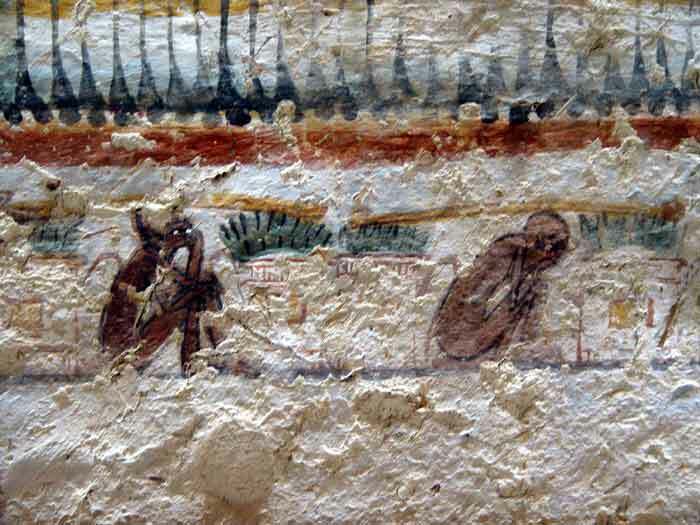 At the top a mourner laments before the upright sarcophagus of the deceased. Behind her two officiants are at work. One presents an offering. 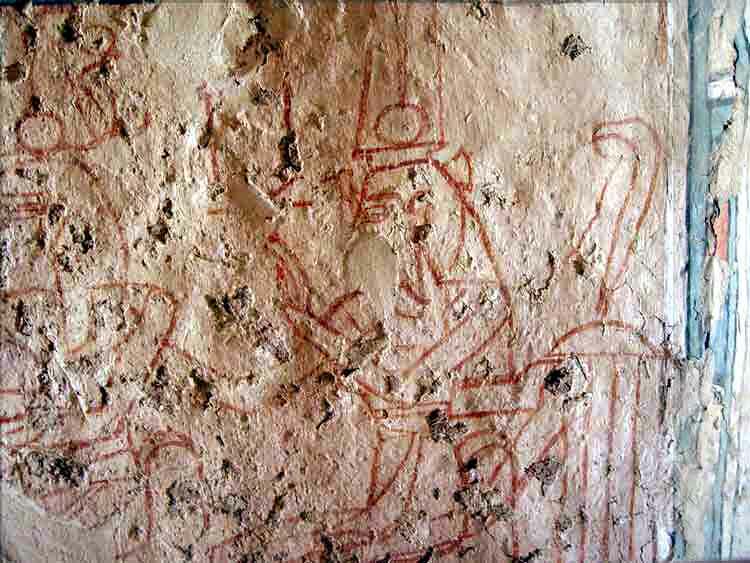 The second holds in a hand the adze with which he is going to carry out the ceremony of the "opening of the mouth" while the other hand rests on a chest containing the other necessary instruments of the cult. 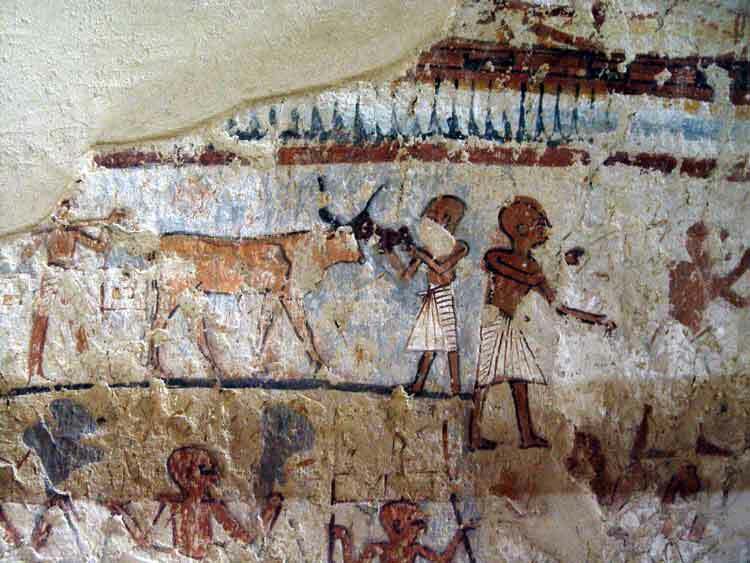 In the lower register , Shuroy is knelt in front of two braziers before the effigy of the cow Hathor who is exiting the mountain of the west in the midst of an area lined with papyrus. This is concerns supplication to the great goddess so that she welcomes him within, where he will be able to be reborn for his own works in the beyond. 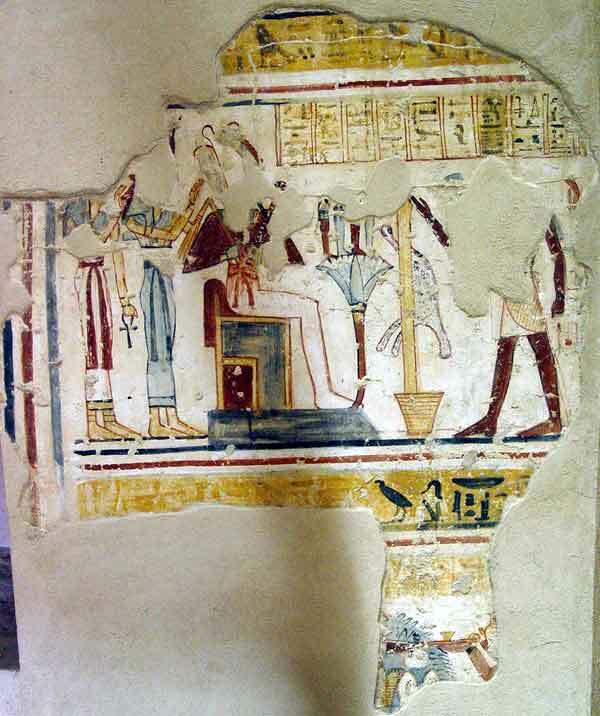 a group of seated priests only by the shaven skull and, underneath, another standing holding a large vase. 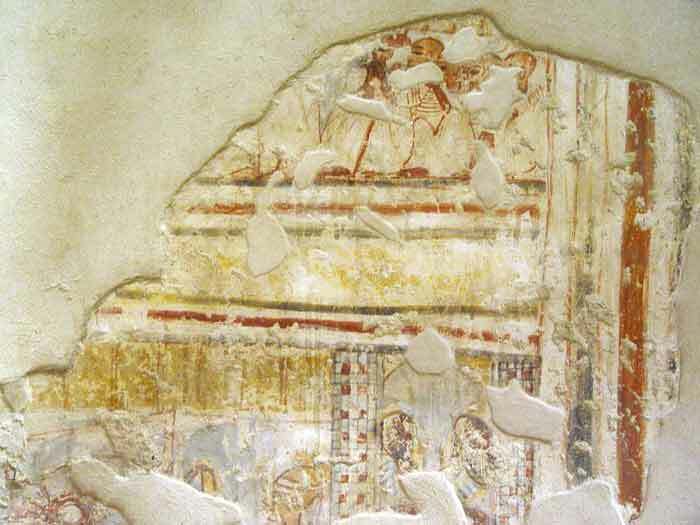 A small fragment of the frieze still exists. One discovers there a motive that can be only be from the XIXth. 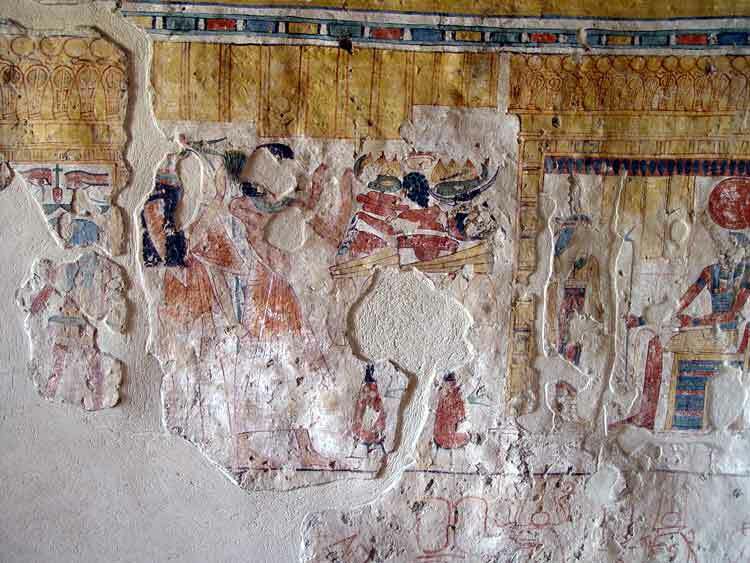 Dynasty alternating figures of Hathor with a magnificent wig, relaxing on a Neb sign and Anubis, guard of the necropolis. 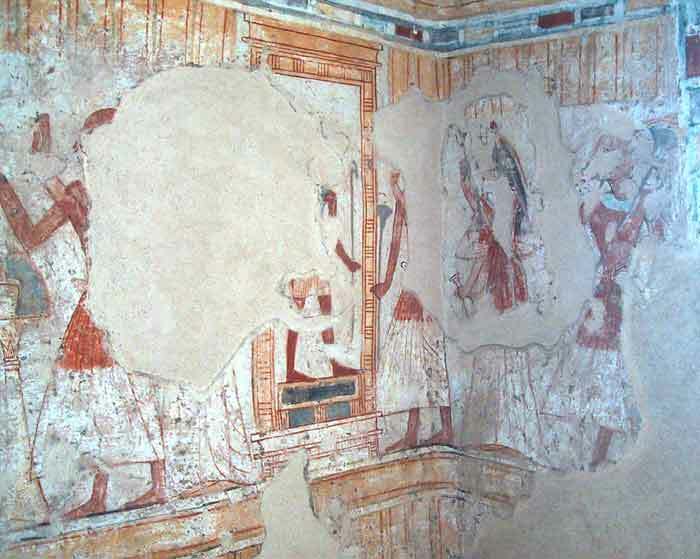 It lacks another element, a kheker frieze. 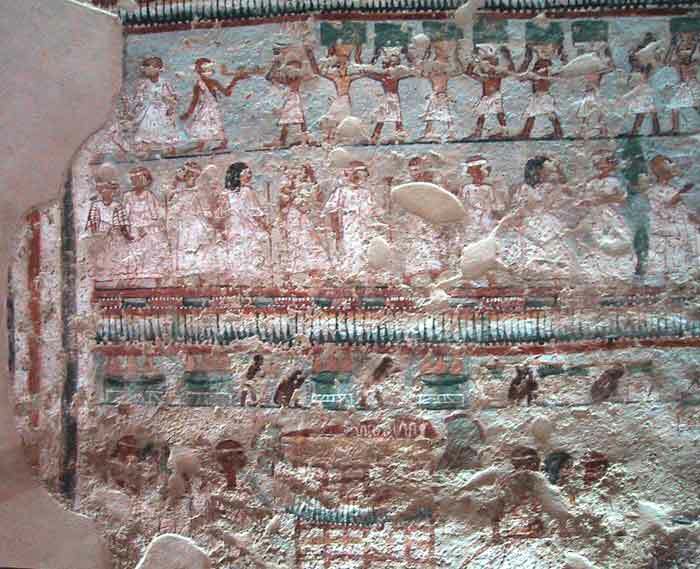 The figures are separated by short columns of inscriptions on a yellow background. 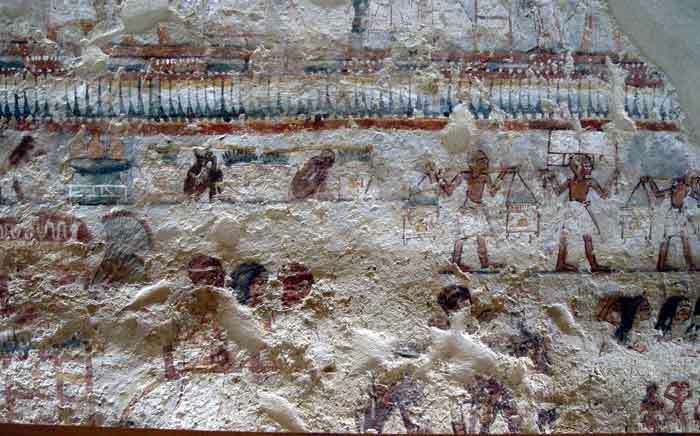 a vast fairly well-preserved tableau describing the procession of funeral ceremony. 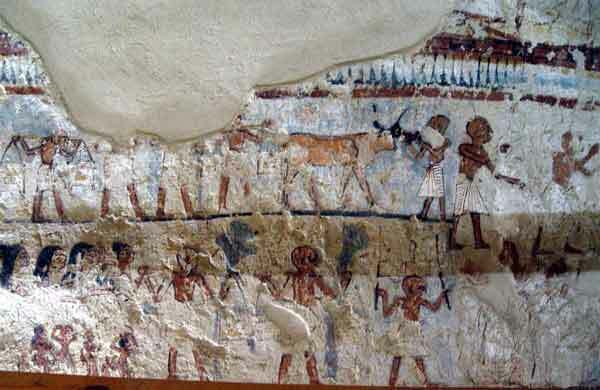 The upper register is divided in two half registers, which in form only represent the end of the processional cortege.
. A long line of bearers with chests follows the official characters of which three are represented on the left in order to make the link with the scene underneath this one. 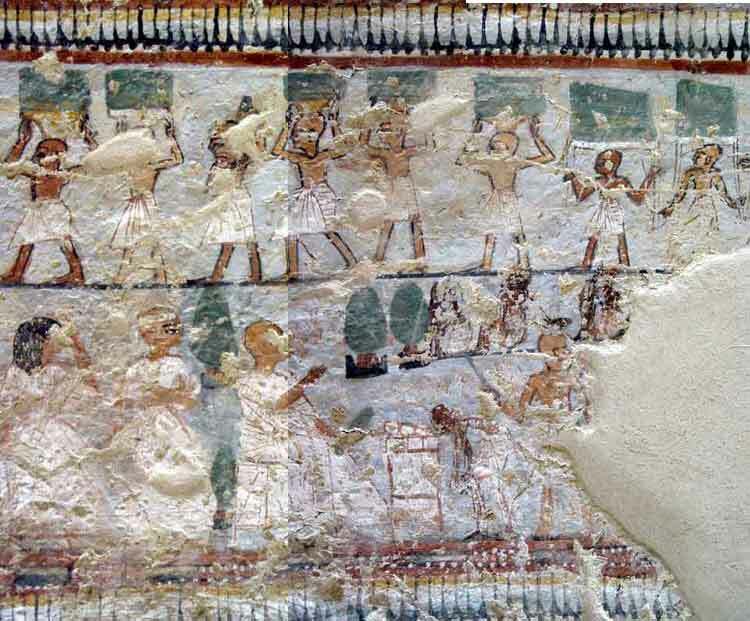 Their rich cloths distinguish them from the simple bearers with loincloths that follow them The last one holds in his hand the censer that will serve in the various rituals practiced on the mummy. In the lower half register, the colleagues and friends of Shuroy, some of which are shaven while others wear a wig. 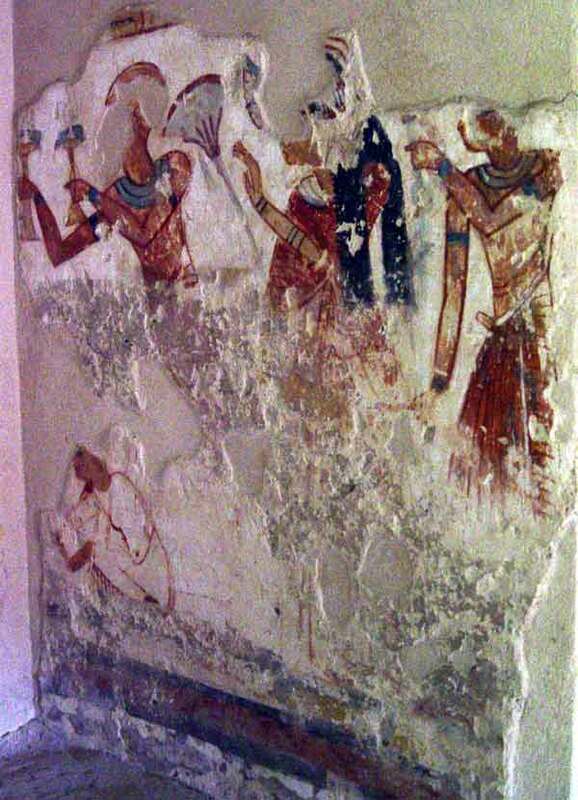 In their hands they hold a stick or scepter. 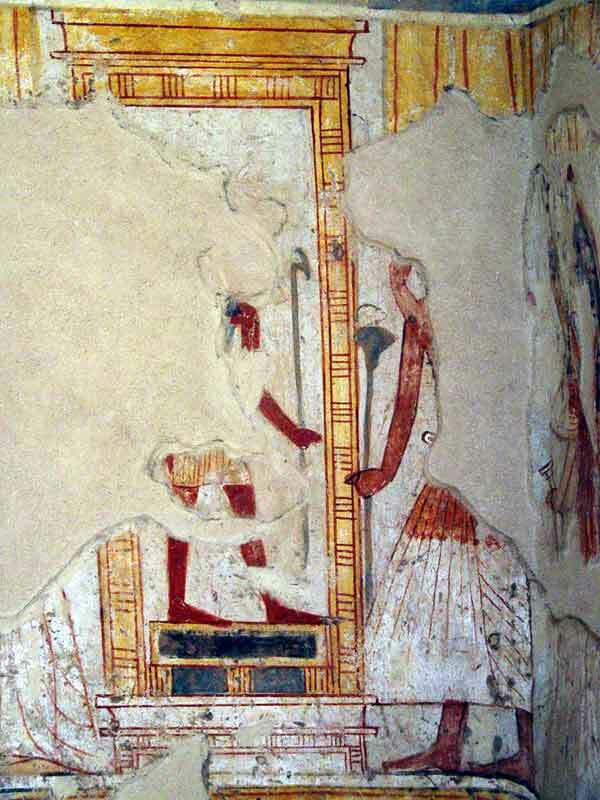 In front, and therefore on the right of the wall, a person is seated on a stool, before a small table (or chest) in front of which a servant is bent . The end of the scene is destroyed unfortunately. The interpretation of the end of the register remains uncertain. A funny scene starts the register: tired, the carriers put down charges to them, and moreover, because they wanted to show by this that they had arrived at their destination Seated on their heels they await. 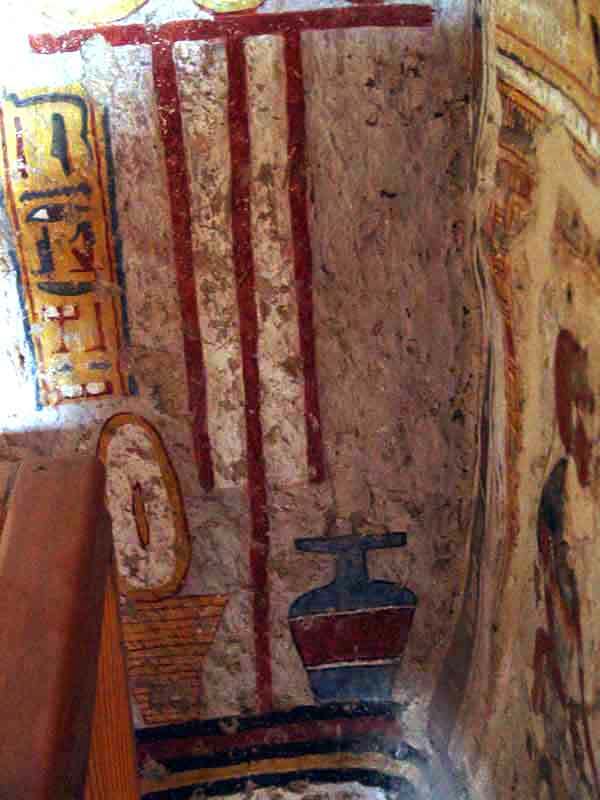 The catafalque (difficult to photograph because of a rail) is decorated with horizontal and vertical yellow and red bandss. 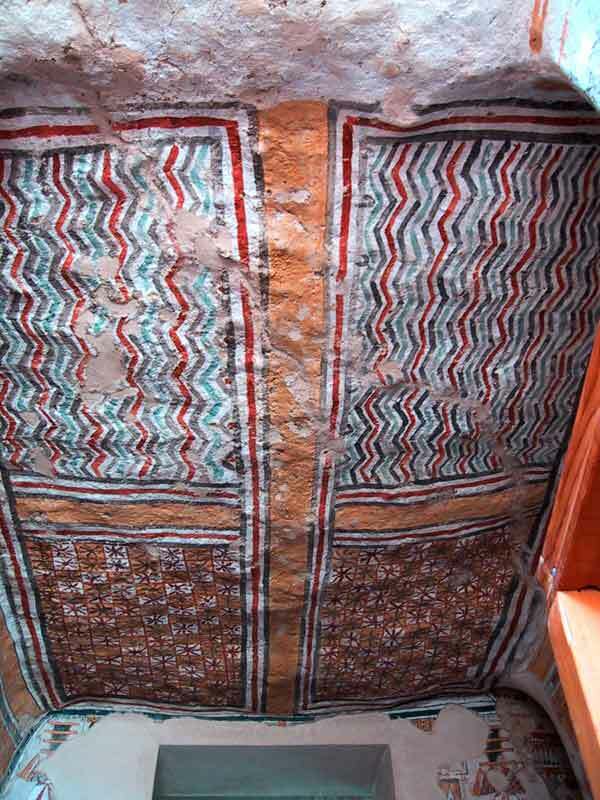 At the top, above a now extint likely frieze of cobras, is a red rounded roof where coils up a large protective white snake. 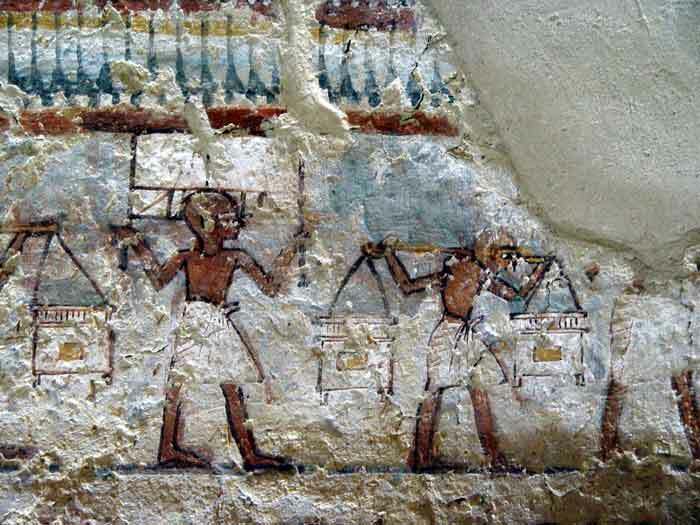 Three characters pull the sledge by means of a thick rope. 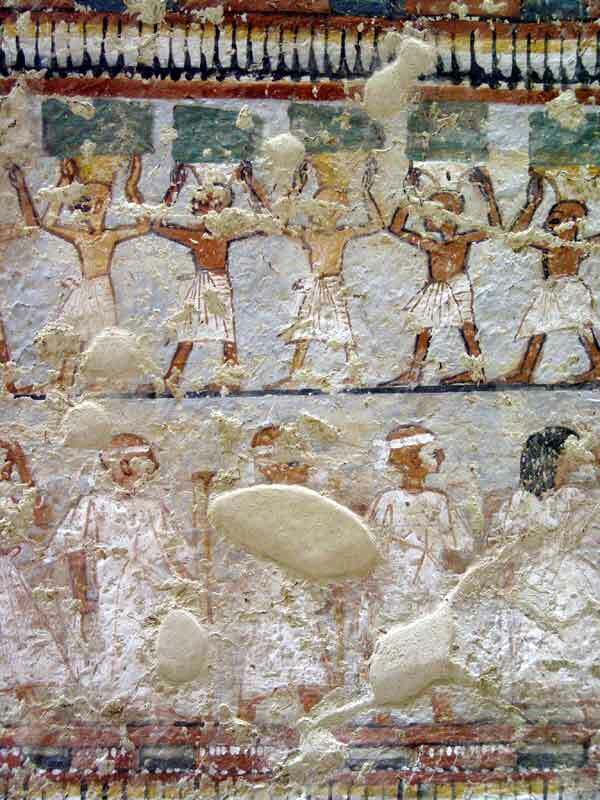 Then comes a group of mourners with childen at their feet, notably naked girls. Before them of the bearers of chests and large bouquets held high. is accompanied by the other women. No text informs us of the identity of the characters, and we don't even know if these are the deceased's children that officiate, nor even if some are. The thieves were incapable of reaching it." (Yuroy = Shuroy).